The vast majority of seniors want to live in their own homes, or “age in place,” for as long as possible. However, how long is it feasible, given the degree of care and support a senior may require and the costs associated with aging in place? The Care Management Program at Bethesda Health Group can offer some thoughts to consider about the costs of staying at home and how aging in place can save money on senior care in some instances. One consideration — where the aging in place is going to occur. 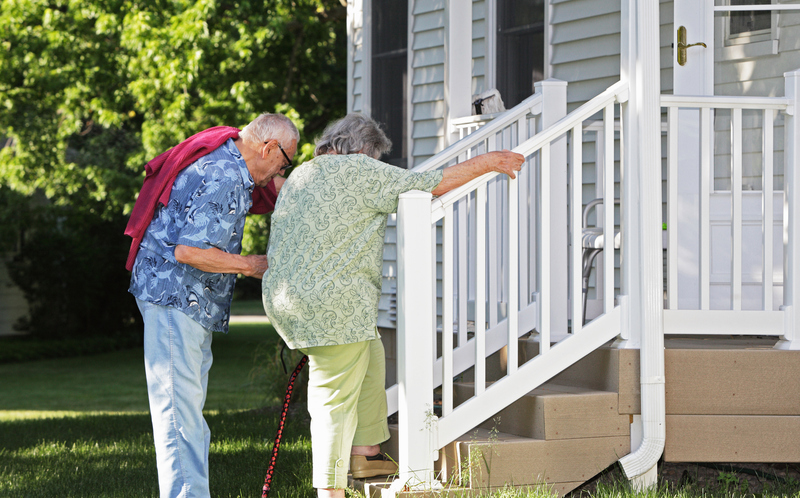 Staying in a paid-off, family home is a great option for seniors who need minimal care. For example, seniors who have lived in their own home for many years may no longer have a mortgage payment. Another consideration – if the care and support required is minimal, family caregivers, neighbors or friends can volunteer to help. However, aging in place can result in costs you may not think of initially. Some seniors are no longer able to maintain their homes, however, maintenance costs don’t have to cost a fortune. Neighbors can be paid to mow the lawn and shovel the driveway. A friend’s teenager can run some errands for you for a small fee. In return for room and board, a relative can move in with you to provide support and supervision. Is Aging in Place Financially Worth It? As the senior’s care needs increase, so do costs. Oftentimes, there comes a point when a senior’s family is not able to provide all of the support necessary. Professional services may become necessary. Whoever seniors choose for senior care and professional services, you should note that these services do not operate like relatives and friends. For example, if all that is needed is help getting dressed in the morning or taking a shower, hired help from a private duty service will come out and help. However, many charge a minimum of four hours at around $22 per hour, which totals almost $100 for the visit. If eventually, around the clock care is needed, it could cost more than $500 per day. Traditionally, seniors consider “aging in place” to mean staying in their family home. However, if we broaden the definition of “aging in place” to include an independent or assisted living community, seniors can save money through consolidated services tailored to their needs. Cost of care in one of the communities during the daytime runs between $5 and $45. (Note: This does not include rental costs.) Compare this to the nearly $100 private duty cost for a four-hour visit at a family home. For 24-hour care in a senior living community, the cost would be around $260 compared to the $500 cost for care in the senior’s original home. Cost advantages are gained because aides are helping many people in the building, so costs are shared. In fact, organizations like Bethesda do not require a four-hour minimum. Rather, 15-minute incremental services can be accommodated. Plus, at a senior living community, the senior’s care needs are continually evaluated, to ensure that the proper level of care is always received. Decisions about aging are complex: How do you make adjustments to the cost of care plans as needs change? What is the ability to meet costs now and in the future? The insurance and other potential benefits for seniors and their caregivers facing these questions are equally complex. Care Management team members can help sort through all the details and make a plan. As a result of the Bethesda Care Management program, residents of Bethesda independent living communities stay in their apartments an average of three additional years after Care Management is contacted for help. Bethesda’s Care Management and Senior Support Solutions programs offer customized support for seniors and their families in St. Louis, whether you live in your family home or at a senior living community. To learn more about our services that help you age in place, contact Bethesda.